Two of the original cottages of London Road, photographed on 7 October 1962. Built in the 1830s as small houses; 102 was a butcher’s shop a few years later. It remained in this trade until the end, which came in 1963 when the buildings were demolished. Do you remember these shops? Did you ever shop at the butcher’s? What about the shop next door? It looks like it did a great line in girdles for ladies – strange to believe women were still wearing things like that in the 1960s. I for one certainly did not go in for that type of torture! Obviously you didn’t obey the order on the advert behind the shops to ‘Drinka Pinta Milka Day’, Jennifer!! I can’t say that I remember anything much about these shops. It does look, though, like the corner of London Road and Baker Street. 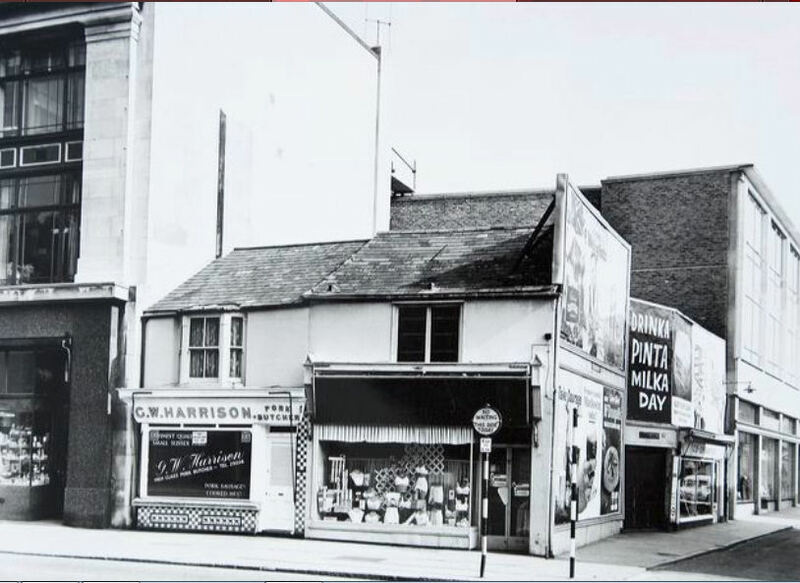 The Co-op used to have a small Baker Street frontage, which I think is the modern building on the extreme right of the photo. Hi Jennifer, the last record of the premises at 103, London Road shows it was occupied by the Broadmead Wireless Co Ltd. in 1960 – a far cry from the type of products on offer in the picture! The underwear shop must have been quite short-lived. Regards, Andy. This is an amazing picture! When I first saw it I had to really get my head around where it was. It is of course the bottom of Baker Street and as a 5 year old at that time I must have been taken past there many times (of course I don’t remember it at all). My Mum and Nan used to take us into town regularly and the route was usually a number 13 bus from Moulsecoomb down to Elm Grove, off the bus for the walk through Union Road to Baker Street, the Co-op; London Road (for Bellmans; Ina’s; Woolworths) then back through the Open Market (into Wicks if we had any pocket money to spend)! My wife grew up in Lower Bevendean and her route was the same, only she used to come into town with her family on the 110 or 111 down the Avenue. I remember the butchers very well. I’m sure a friend of mine went to work there when he left school, this would have been about 1962 as he was a bit older than me. He lived on Campbell Road like me and his name was Tony Mengem. Are you sure these buildings were demolished? It looks like they’re still there and have been knocked through to create one premises, which is now a newsagent. There is a butchers that appears to have been tacked onto the end of the row. If you look on google earth it all seems very similar, just some adjustments to the roofs and windows. It’s on the corner by the entrance to the London road side of the open market. Editor’s note: The photograph shows the end of Baker Street. The butcher’s shop is on the end of Marshall’s Row which is up the side of the old Open Market. Do you remember the shop? 'Roma' Ladies Fashions. Western Road.